You know the students who never did the reading and managed to get by using CliffsNotes? 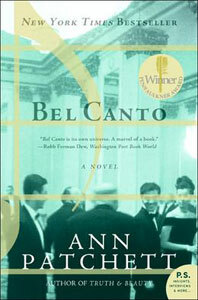 That was me – except in the case of “Bel Canto.” The Ann Patchett book is based on the Lima Crisis of 1996 – 1997 during which revolutionaries invaded the Japanese ambassador’s home in the midst of a party and held the guests hostage for 126 days. In Patchett’s book the story is relocated to an unnamed country and focuses on a birthday party thrown at the vice president’s home for the chairman of a major Japanese electronics company called Nansei. Key characters include Nansei chairman, Katsumi Hosokawa, his translator, Gen, and renowned American soprano, Roxanne Coss. Check out what Weitz had to say about the status of the project below and keep an eye out for our full interview with the director when “Admission” hits theaters in March. Paul Weitz: I’m just taking notes on it. There have been a lot of great directors attached to develop it. [Laughs] And there’s the producer, Caroline Baron and her husband, Anthony Weintraub, who produced “Capote.” I met her because she line produced the last couple of films I made, “Being Flynn” and this film. They sent me the book and I really had no particular intention of getting involved, but then I kept on thinking about it. I had actually read the book a few years ago and then I re-read it. The story is operatic in nature. It’s tragedy and love on a grand scale, and about human communality and the soul. Having said that, there’s no doubt massive traps in terms of an adaptation of it being bad [laughs]. When I adapt something, with that or with “Being Flynn,” I do my own index of the book. I read through the book on a page-by-page level and do an index, so I’m in that stage right now, so I’m just in the early stages of working on it. Any ideas for it in terms of tone and scale yet? Weitz: I thought “Lincoln” did a great job of telling a massive story, but being very compact and using scale in almost a theatrical style. With “Lincoln,” you don’t see him talking to a large group of people until the very end of the movie. It’s a very good decision filmically and it’s also less expensive. [Laughs] “Bel Canto” is all largely set in the vice president’s manor. In the book it’s an unnamed Latin American country. It’s based on a hostage situation in Peru, I believe. So it’s a little bit like a Buñuel movie where everybody’s trapped together and there’s a serialistic aspect to it. But so, in some ways, it lends itself to being done compactly. Also, I’m not deluding myself into thinking that anyone’s gonna give me a lot of money to make it.